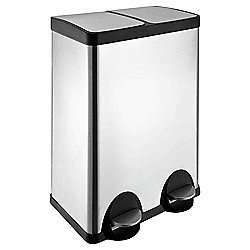 Just purchased Stainless Steel Recycling Pedal Bin with Two Sections 60L From Blackpool Tesco Extra. Not sure its nationwide or not. Prepare for the wild goose chase! Yes online its 65 £ i clearly mentioned that i purchased from Blackpool Tesco Extra. 3 available at 6.30 PM. Yes online its 65 £ i clearly mentioned that i purchased from Blackpool …Yes online its 65 £ i clearly mentioned that i purchased from Blackpool Tesco Extra. 3 available at 6.30 PM. Tiptop spot and what a great price! Who would pay 65.00 for it. Was it marked up at £6.50? Yes Marked as £6.50. Even the lady on till get surprised on the price . 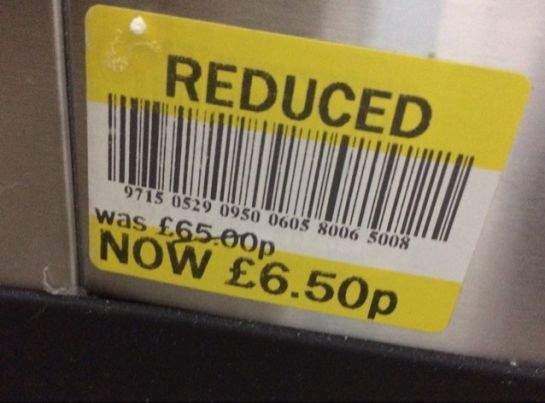 It was not at all price error. I think they are creating space for upcoming Christmas Deals. So probably getting rid of large size stuff. Heat from me, just to balance out the negative ones that vote cold without (a) needing the item or (b) wanting the item but can't be bothered to check their local. Fantastic bargain if you bag one. Just seen few more with the yellow sticker showing reduced price. if u r nearby then try your luck as i saw few still available there. 765 degrees of heat for a store specific deal with very limited stock? Anyone seen this in Northern Ireland?